The freedom movement for Kashmir has always suffered major obstacles. India’s influence on the world stage has been a huge stumbling block for those advocating Kashmir’s right to self-determination, the world conveniently turning a blind eye to the plight of Kashmiri people has been a demoralising factor. But one factor that has strongly affected and greatly impacted the freedom movement is how the movement has often been subjected to internal politics, bickering and groupism. The freedom movement has always seen factions within it, but in recent times it has dented the Kashmiri cause a great deal. We have seen a tussle for leadership within the freedom movement of late, with individuals wanting to spearhead the movement on their own terms. On the surface, it may seem harmless, but, it has done a great deal of damage to the extent that it has stunted the growth of the movement. What we have witnessed of late is the glorification of individuals that have set out to become bigger than the cause itself. This movement was never about an individual, and it certainly does not need a Martin Luther King or Nelson Mandela. This is not about one person, but many people that are scattered across the world and share a similar goal, despite living in separate parts of the globe. The dream of being able to determine their own destiny is what has kept the movement alive. But this movement is fragile, and far from united. It is moving along but without direction, because it has become consumed by selfishness and self-interest. 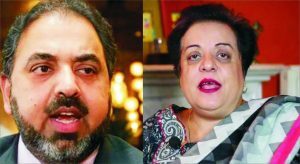 An example of just how distorted this movement has become is the recent exchange of words between Lord Nazir Ahmed and Human Rights Minister, Shireen Mazari. Mazari responded to Mr Ahmed after he made some criticisms of the present government and commented on the internal situation in Kashmir. Mazari responded by telling the Lord to mind his own business and that as a Pakistani, she has every right to comment on Kashmir. The Minister’s tone was harsh and clearly did not go down well with Nazir Ahmed and his supporters, who felt that the Minister was out of line for the nature of her comments. Who is right or wrong in this feud is a separate discussion. But what it does highlight is the fact that the issue of Kashmir has become internally politicised, and this has always provided India with a field day. This is exactly what they want – for the movement to be heavily fragmented and for internal bickering to continue. It simply takes focus away from what matters most – the gross Human Rights violations in Kashmir. We have also seen in recent times the rise of Mr Yasin Malik’s wife, Mishal Malik, further into the limelight, with several people within the movement advocating for her take up the role of leadership within the movement. Mishal Malik has been very active on the Kashmir issue and has been vocal on the Human Rights violations. Her efforts are appreciated. However, pushing her to the forefront is rather unwise and makes little sense. Let us be clear, any support for the Kashmir movement is greatly welcomed. Who is speaking does not really matter, what is being said matters the most. However, there is a big difference between lending support and taking up responsibility for an entire movement on your shoulders. And let us be honest, being married to a Kashmiri regardless of who he is, does not automatically give you authority to be speaking for an entire movement. Kashmir is a complex, long standing international issue, recognised by the United Nations. And what it really needs is for its own people to represent it. People that have genuinely been a part of the struggle. People that feel the pain, that have suffered at the hands of India’s occupation. People that have been displaced. People that are waiting to return. There needs to be a direct affiliation to truly understand just how complicated and painful Kashmir is. And the movement needs people that are not controversial in any way. The right to self-determination can only be achieved peacefully, without the use of violence. The only real solution is an international one, through the United Nations. And so, to have Mishal Malik as the face of the Kashmir movement will not send a positive message internationally. Regardless of what Kashmiris may think of Yasin Malik, his image in the west is neither positive, nor will it do any favours to the Kashmir cause. Civil society, Human Rights activists, the common man and woman along with the support of the Pakistani government, need to work together to keep Kashmir alive on the international platform. This needs to be a collective effort, not something for self-glorification. Kashmir does not need a poster boy/girl. It simply needs a solution. And that can only be achieved if there is a collective effort to engage the big players of the world and to explore every avenue possible to not only discuss Kashmir’s right to self-determination, but to also discuss India’s brutality towards the common man, woman and child, which is unacceptable. Exposing India’s brutality on the international stage is incredibly important but cannot be achieved if the movement remains deeply divided and fragmented. Some people may argue that this fragmented movement just might need a figure to move it forward. That might be the case for other movements. But not every cause requires a leader. Every movement is of a different nature and does not necessarily operate the same way. Kashmir’s cause does not need a messiah. It needs sincerity. It is about time the movement stopped being so self-centred, with vested interests. That is why Kashmir has failed to grab global attention and has hardly been taken seriously. Kashmir is not a business. Kashmir is hope. A wish. A dream that its people are still believing in. The plight of Kashmiris should not be milked for personal gains. The plight of Kashmiris needs to be understood, felt and given a voice on every available platform. But it cannot and must not be hijacked by individuals or tainted by gang mentality. Kashmir belongs to the people of Kashmir and that is how it should remain.